Opportunity at Adams Land and Cattle for a self-motivated individual who has an interest in cattle and horses as it relates to the movement and safe handling of cattle. This position is located at our South Feedlot in Broken Bow, NE. • Coordinating cattle locations and movements with other departments. • Counting and verifying cattle. • Moving and shipping outgoing cattle. 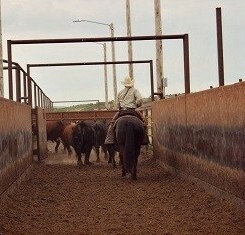 • Assisting with the unloading and movement of incoming cattle. • Assisting with the flow of cattle to and from the processing/sorting facility. • Cattle movement knowledge and experience. • Beef Quality Assurance experience. • Commitment to safety and quality culture. • Individual must be team-oriented. • Feedlot experienced is preferred. • Individual must provide three (3) head of horses. • Individual must be able to work in adverse weather conditions if needed.